Project Debater can formulate arguments, but can’t quite refute opponents. Machines are creeping closer and closer to a real understanding of language with all of its nuances and subtext. But for now, the best machines still can’t compare to humanity — a shortcoming made clear at a high stakes debate on Monday evening. In one corner was Harish Natarajan, a finalist at the World Debating Championships in 2016. His opponent was Project Debater, an AI system built by IBM that assembles logical arguments and responds to its opponents, according to CNN. Both participants were told the topic 15 minutes in advance — Natarajan was to argue against government-subsidized preschools and Project Debater would advocate for them. Both sides presented a four-minute introduction, then took turns rebutting each other before presenting closing arguments. While CNN reports that Project Debater presented eloquent arguments, Natarajan ultimately won as he swayed more of the audience to agree with his side. Project Debater may have lost in part because it spent its rebuttal period continuing its own arguments rather than trying to counter Natarajan’s, according to CNN. However, pieces of a rebuttal came later as part of Project Debater’s closing arguments. The disorienting debate strategy suggests that AI can’t quite compete with the human brain, though projects like IBM’s are making impressive inroads. 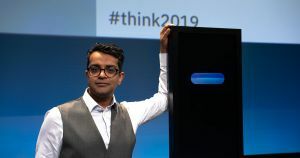 “It’s really pushing the boundaries [of the] kinds of AI systems that are more interactive with us and can understand us better,” IBM research director Dario Gil told CNN.